Does not override the run() method to start() the thread. No compile and run time exceptions. //Multiple threads share the same object. //Creating new instance for every thread access. Apart from this, object oriented designs have some guidelines for better coding. Coding to an interface rather than to implementation. This makes your software/application easier to extend. In other words, your code will work with all the interface’s subclasses, even ones that have not been created yet. Example: coding to an interface. Assigning HashMap object to interface Map, suppose in future if you want to change HashMap to Hashtable or LinkedHashMap you can simple change in the declaration part is enough rather than to all the usage places. This point has been elaborately explained here. Which one is best to use? Ans : Very simple, based on your application requirements you will use this appropriately. But I would suggest, try to use interface inheritance i.e., implements Runnable. Static Import is a new feature added in Java 5 specification. Java 5 has been around the corner for some time now, still lot of people who are new in Java world doesn’t know about this feature. Although I have not used this feature in my work, still it is interesting to know about. So whats the advantage of using above technique? Only advantage that I see is readability of the code. Instead of writing name of static class, one can directly write the method or member variable name. Also keep one thing in mind here. Ambiguous static import is not allowed. i.e. if you have imported java.lang.Math.PI and you want to import mypackage.Someclass.PI, the compiler will throw an error. Thus you can import only one member PI. In order to use the static import flavor of java. We have to declare all the variables and methods as static and public for availability and accessing methods and variables using Class name. its better to call it import static to avoid syntactical errors. See the examples below. the output of the program “gopalakrishna” . it seems that the string s1 content is modified. Earlier s1 got “gopal” and s2 had “Krishna”. 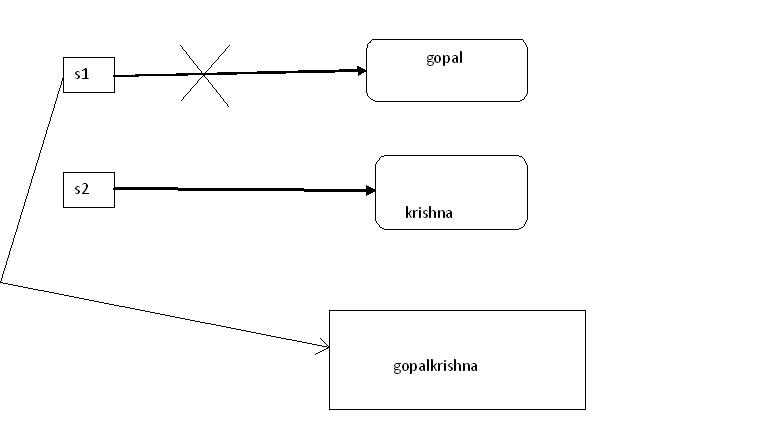 After s1+s2, they are joined and total string become “gopalakrishna”. This string is assigned to s1 again. If s1 is mutable, it gets new string “gopalakrishna”. This is what we can see in the output. So s1 appear to be mutable. But we learned that strings are immutable. s1 is definitely immutable. But why the output of the program like that? In the program, jvm creates two objects, s1 and s2 seperately, as shown in the below figure. When s1+s2 is done, jvm creates new object and stores the new object and stores the string “gopalakrishna” in that object. But it doesn’t modify the contents of the string s1. After creating new object, the reference “s1” is adjusted to refer to that new object. The point we should observe here is that the contents of the string s1 are not modified. This is the reason string objects are immutable. The old object that contains “gopal” has lost its reference. So it is called “unreferenced object” and garbage collector will remove it from memory. The Polymorphism exhibited at compile time is called static polymorphism. Here Java Compiler knows without any ambiguity which method is called at the time of compilation. Of Course, JVM executes the method later, but the compiler knows and can bind the method call with method code(body) at the time of compilation. So, it is called ‘static binding’ or ‘compile time polymorphism’. Static methods, private methods, and final methods and variables are examples for static polymorphism. The reason is that all of those methods maintain single copy in memory that is available to the objects of the class. So the java compiler knows which method is called at the time of compilation and it needs not wait till the objects are created. The Polymorphism exhibited at runtime is called dynamic polymorphism. This means when a method is called, the method call bound to the method body at the time of running the program, dynamically. In this case, java compiler does not which method is called at the time of compilation. Only JVM knows at runtime which method is to be executed. Who will decide which method is to be executed? Is it java compiler or JVM? Methods are called by using an object, the java compiler can not decide at the time of compilation which method is actually called by user. It has to wait till the object is created for class. And creation objects take place at runtime by jvm. Now jvm should decide which method is actually called by user at runtime(dynamically). A filter in the HB provides environment to pass conditions of the persistent logic from outside the java sources through HB mapping file. A HB filter is a global, named, parameterized filter representing conditions like where clause. Having the ability of enabling or disabling them for a particular Hibernate Session. Working with filters is nothing but making the conditions of the queries coming to application through hibernate mapping file. Filters of hibernate are introduced from Hibernate 3.x version. 2)link/configure filter with Hibernate pojo class through the Hibernate mapping file. 3)Enable filter on Hibernate Session Object and supplies values for filter parameters. following resources are needed . We know about interceptors are available in frameworks like strus2, spring. Even Hibernate ORM tool also having this kind of feature. Interceptor means request processing life cycle. Interceptors will be invoked based on the requirement like before saving a record into table, updating record, deleting a record and so..on. In Hibernate I have gone through the EmptyInterceptor class. It doesn’t have any methods we ourselves configure the methods like below. This method is called when Hibernate detects that an object is dirty (ie. have been changed) during a flush i.e. update operation. Let see our application developed using hibernateinterceptor concept and following files are needed.